An understanding of seasonal pasture growth potential and rainfall outlook will help you. Maintaining soil cover is essential to minimising soil erosion initiated by rainfall impacting bare soil. Rainfall has many times more energy than run-off water. For example, a rainstorm that delivers 10mm of rainfall dumps 100t/ha of water, with raindrops hitting the ground at a velocity of about 8m/sec (or 30km/hr). When raindrops impact bare soil a number of things happen. The soil surface is compacted, thereby reducing its infiltration capacity and promoting run-off. Surface soil particles are broken and splashed into the air. If these particles land in run-off water they are easily carried away. If they contain plant nutrients, obviously, that goes too. If the splashed particles land on bare soil they can block up soil pores and further decrease water infiltration rates. On sloping sites, particles are splashed further downslope than upslope and this causes a net movement of soil down the paddock. Raindrops impacting bare soil are the initiators of most erosion and run-off. In comparison with rainfall, run-off has less volume (since only part of the rainfall becomes run-off) and is generally travelling more slowly — about 1m/sec (3-4km/hr). In intense storms there can be sufficient run-off on the move to wash away soil and form channels where the soil is not adequately protected. 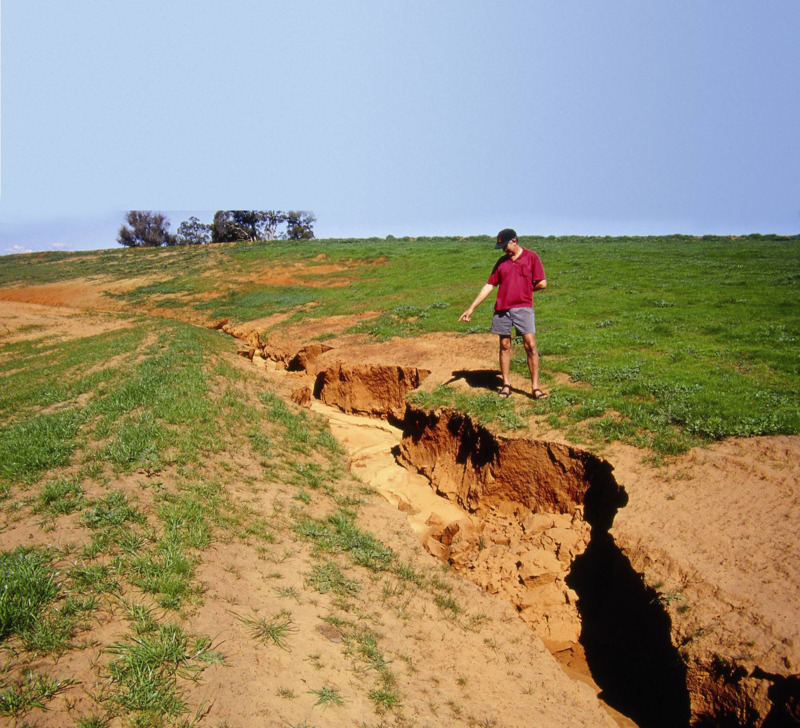 Wind erosion can result when wind causes soil particles to roll or bounce along the soil surface. When these particles land, they smash into other particles which may be knocked loose from the soil surface and also start bouncing along the soil surface. As wind speed increases, the number of particles on the move increases. The finer particles, released by particle collisions, can be carried upwards and initiate dust storms. Just as for preventing erosion initiated by rainfall, maintaining soil cover provides a barrier between the erosion agent (the wind) and the soil. Landholders with livestock need to regularly monitor their pastures to manage soil erosion and when bare patches of ground emerge, remove stock from the paddocks. Bare patches are particularly likely to occur during summer and autumn, prior to opening rains and during drought. Pads (livestock tracks) can become sites for erosion. Livestock walk straight to the water point when they are thirsty and graze away from water after they have had a drink. So pads converge on water points; pads upslope of a water point concentrate run-off towards that water point, while pads down slope spread run-off. Arranging a fencing layout that sees water points in the upslope portion of paddocks will help in reducing erosion caused by pads. Keeping gates closed stops padding between paddocks, but requires each paddock to have its own water point. In the case of erosion control in crop production, the benefits of conservation agriculture (CA), which is better known as minimum tillage in Australia, are being recognised worldwide. CA has three key aspects; minimum, or no-tillage farming, crop rotations and the maintenance of soil cover. 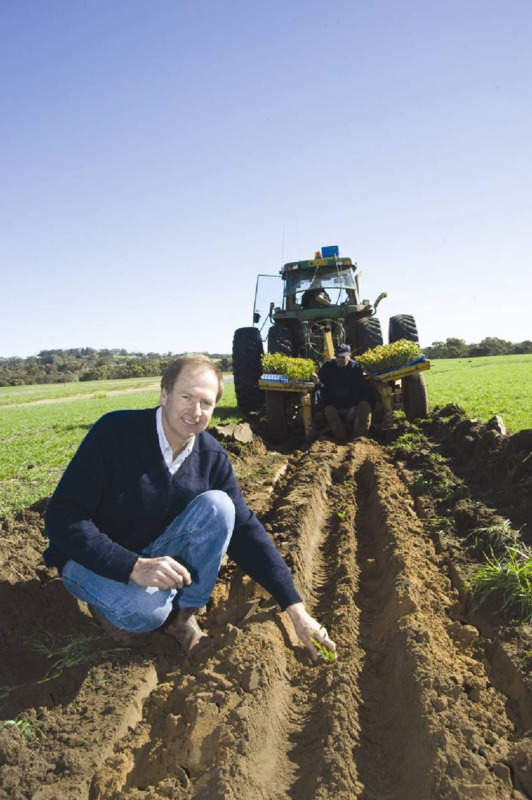 Farmers in Western Australia’s East Yornaning area claim the change to minimum or no-tillage farming during the past 20 years has resulted in less erosion, more consistent crop establishment, higher yields (in the majority of years), less crop failure during low rainfall years and less salinity in the valley floors. disturbing the soil as little as possible when seeding the next crop. Seed and fertiliser are applied using specialised equipment that use narrow tines or discs to cut through the previous stubble and to make narrow seeding furrows in the soil. As fertiliser prices rise, there is an added advantage of leaving stubbles standing in the paddock. Rain will leach the nutrients they contain back into the soil and thereby reduce the amount of fertiliser that has to be applied to the subsequent crop. But, such a practice is not advised if a crop contains insects or diseases that could be carried over in the stubbles to the next crop. Farmers need to have some areas of bare soil for roads, firebreaks, yards and roaded catchments. In addition, some run-off is beneficial, and is required to fill dams, flush watercourses and provide water to people downstream. Implementing a conservation farm plan will allow landholders to control run-off without it causing erosion. amount of water falling onto an unprotected soil surface (as occurs at the head of a gully). A plan will design and locate facilities, such as protected watercourses, roads and fences, in appropriate positions. Natural watercourses need to be protected from cultivation and only grazed when fuel reduction is required to reduce the risk or effect of a bushfire. Ideally, farm roads and fences should be located on ridges, spurs (straight up and down the slope where it is not too steep) or immediately downslope of contour or grade banks. Roads on ridges or spurs shed water away from them and are likely to be serviceable in all weather. Hillside dams need to be located on the upper or mid slopes. Hillside dams and dams in watercourses should have adequate freeboard and be well designed and constructed with maintained spillways. To prevent erosion caused by severe rainstorms, roaded catchments need to be built on adequate gradients. Eroding catchments fill dams with silt, reduce dam capacity and depth and undo all the good for which the roaded catchments were installed. Firebreaks, particularly those on steep slopes, need to be established with herbicides. Ploughing or discing firebreaks on steep slopes loosens the soil and promotes erosion. TIP: Instead of installing firebreaks on particularly erosion-prone sites, shire councils will usually accept a written application to site the firebreak in an alternative location. Protect yards and feedlots from run-off by installing a grade bank upslope of the yard, and locate yards as far from watercourses as possible to minimise the release of nutrients. Run-off control structures are designed to control run-off velocity and depth. Structures intercept run-off flowing downslope before it reaches erosive velocity. One of the main factors in run-off velocity is the steepness of the land. Hence, on steeper slopes, contour and grade banks, interceptor banks and mitre or spur drains (to carry run-off away from roads) need to be closer together than on gentle slopes. Having intercepted the run-off, it must be discharged safely, either into a stable watercourse or onto a vegetated area. Grade banks, as their name suggests, are designed and built to a controlled gradient to transmit water at a low velocity and shallow depth to a stable watercourse. The gradient is critical. Too steep and the water will become erosive, too gentle and the channel will silt-up and cause overtopping in intense storms. It is most important that structures are designed and built properly by people who are qualified and experienced in such work. It is important to protect your valuable topsoil as this is where the majority of nutrients are found.